One year ago, Aquasana introduced a new reverse osmosis water filter: OptimH20. Combined with our high performance Claryum filtration technology and re-mineralizer, OptimH20 removes more contaminants than any other technology on the market today. This filter is the most comprehensive filter on the market, reducing more contaminants than the competition including all of the chemicals you hear about on the news: fluoride, perchlorate, heavy metals like lead, mercury and chromium, nitrates and other harmful contaminants from drinking water. OptimH2O is the first reverse osmosis system of its kind to pair the powerful filtration of reverse osmosis with the high performance Aquasanas Claryum filtration plus re-mineralization. This new, easy-installation filtration system delivers clean, healthy, fluoride-free drinking water without stripping water of its healthy minerals. Traditional reverse osmosis systems remove naturally occurring trace minerals. 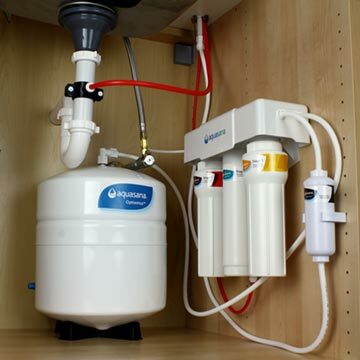 The Aquasana Reverse Osmosis System with Re-mineralizer removes 96% of fluoride as well as 71 additional contaminants including chlorine and chloramines (chlorine + ammonia disinfectant), pharmaceuticals, arsenic, cadmium, lead, mercury, herbicides, pesticides and asbestos. Fluoride is a hot topic for people. Many studies show fluoride is harmful, and we were inundated with requests from customers who wanted an effective removal solution. The problem is, removing fluoride from water isn’t easy. Our filter removes dissolved solids smaller than 1 micron. A filter this precise is needed to grab fluoride, but it also removes healthy minerals and naturally occurring trace minerals like calcium, potassium, and magnesium. These minerals maintain the pH balance of water and add nutrition and taste to water. So we had to develop a system that would maintain all the good parts while taking out the bad. After a year of careful consideration and development, we finally had a Reverse Osmosis System we would put in our own homes, and in fact I did! I’ve used the system in my own home and the timing couldn’t be better. The arrival of the OptimH2O coincided with the arrival of my daughter and it gives me peace of mind knowing the water my baby drinks is free of fluoride.